AECURN SA ... Welcomes our interstate colleagues. 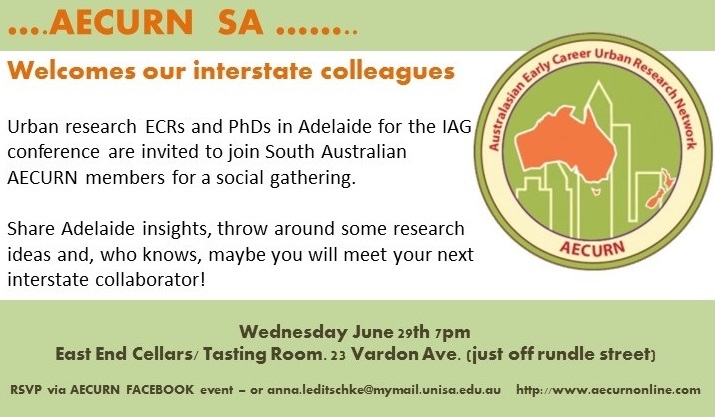 Urban research ECRs and PhDs in Adelaide for the IAG conference are invited to join South Australian AECURN (Australian Early Career and Urban Research Network) for a social Gathering. Share Adelaide insights, throw around some research ideas and, who knows, maybe you will meet your next interstate collaborator! 23 Vardon Ave, just off Rundle Street.